If I Was, was recorded on a series of trips to the isolated snowy outback of Eau Claire, Wisconsin – the same area where Justin Vernon (Bon Iver frontman) recorded his seminal debut album For Emma, Forever Ago. Justin also takes up production on this album by The Staves here and it’s clear to see his influence on this album but don’t let that fact fool you. The Staves punch above their weight here in a classy and confident style. The 2nd offering from the three sisters of Watford reveals a mature sound and recognises them as a force to be reckoned with on the folk scene. It declares that they can use their talents as a creative and potent weapon. During the recording of this album, they spent a lot of time on the road and away from their native sunny Watford in Hertfordshire and I think this has really enabled them to expand their musical horizons. The environment which they surrounded themselves in has really had a positive effect on their sound and its here in abundance. From the outset, the overall production style is full of immaculate folk harmonics, the arrangements are perfectly suited to their voices – their ever-present interwoven harmonies are gorgeous on opener Blood I Bled – it culminates in a sudden crescendo with a fleet of woodwind and brass – beautifully timed and orchestrated. The acoustics and fluttering drums on Steady complement the three sister’s irresistible vocals and this lends itself to compelling effect. The arrangements on If I Was are so pristine. They reflect that of the Fleet Foxes; lush harmonies, intricate arrangements and the track Let Me Down has a lot of Bon Iver style vocal loops which are used in an invigorating way. You can tell a lot of care and attention has gone into the making of this album. Each breath and every subtle strum here are caught and captured effortlessly. Throughout the recording of If I Was feels like a coming-of-age experience for The Staves. There is a sense of warmth and honesty which glows intensely and I think there’s a lot to be said in the relationships they made with Justin Vernon and the rest of the session musicians during the recordings. Lead single Black & White is a confident, strident number, reminiscent of fellow folk contemporary Feist. 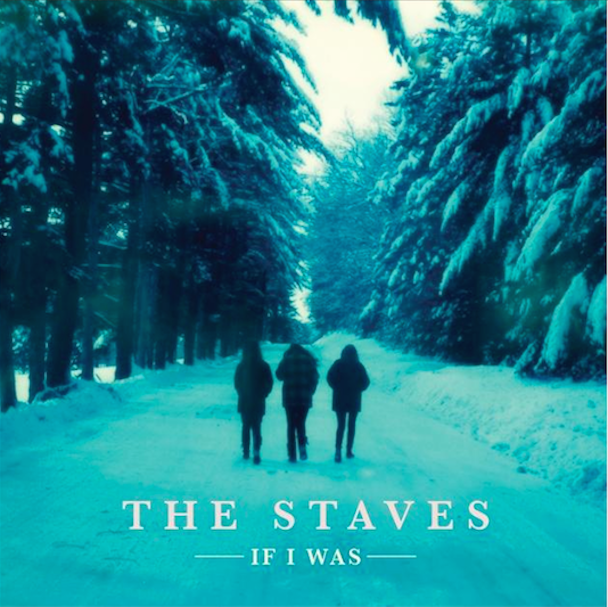 It has a rockier beat and also showcases the versatility of The Staves’ vocal prowess. Displaying a more aggressive range but never overdoing it to ensure they don’t show their vocal powers up. The brass section and drums complement their vocals to their full. Credit to the Producer is not short in supply here either. On tracks like Damn it all, Justin Vernon shows how much depth can be brought out a simple acoustic strum and turn it into something both whole and uplifting – definitely one of the highlights on If I was. The playful piano skip on the track The Shining reminds me of Nick Drake and offers a different sound and vibe which only serves to give a more colourful and robust character to the overall feel on offer here. The width of instrumentation on this album is really impressive too. A brass section breathes life into Horizons and this again complements the ever lush vocalisations of the Staves. This continues to impress on other tracks such as Teeth White. One of the realisations on this album, after repeated listening, is the ability The Staves have to make their vocal harmonies fit together with the accompanying musicians – it’s displayed encouragingly throughout the course of the album. Make It Holy has a power that lends itself brilliantly to the inclusion of extra backing vocals – which I think gives a sense of inclusion here with the rest of the band they play with. The self-realisation vibes of album closer Sadness Don’t Own Me ends the album on a touching and sombre note which will make sure that the album will remain long in the listener’s conscience. The combination of The Staves natural vocal harmonies and Justin Vernon’s attention to detail, along with the love he has for making instruments produce their resonance, works effortlessly on If I Was. It’s certainly an album to make a date with.